This is the class that you didn’t know you’ve been waiting for! Whether you are trying to build your dog’s skills, find something fun to share with your dog, burn some energy in your active dog, or just have an entertaining social activity, this is the class for you. 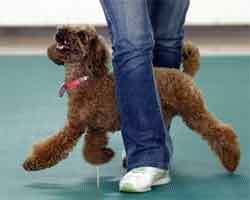 Dances With Dogs is similar to Canine Musical Freestyle, but with some fun twists. Great for all breeds, it is a mixture of obedience training, tricks, and music that allows for fun interaction between dogs and their owners. No dance ability is needed. It is even fun for the rhythm-deprived! At its best it illustrates the joyful relationship of the dog and handler team. Don’t wait to register or you’ll miss it. This indoor class (beat the heat and rain!) is a fun 6 weeks long. Let the games begin! Your dog must be fine around other dogs and people (either friendly or be able to ignore them) and be under control around other dogs. Fido Fun and Games is perfect for dogs of all ages and abilities. Burn some energy so that your dog gets into less trouble at home; a tired and satisfied dog is a calmer dog! Beat the heat! This class is held indoors!